It seems that Jan Kuom (WhatsApp cofounder), has been rethinking how WhatsApp will make money for its investors by “copying” WeChat’s monetization playbook. WhatsApp did not have a real revenue model when it was acquired by Facebook for $19 billion in 2014. From available records, the 2014 Facebook Form 10-Q showed that the nine months preceding September 30, 2014 when Facebook acquired WhatsApp, it had only generated a paltry revenue of $1,289,000. This money was made by charging users an annual fee of $0.99 after the first year. Even this fee was waived to enable the app gain adoption in most markets. However, with almost 1 billion users, it is time for Facebook/WhatsApp to make their money back. What is the use of backward integration and support for these outdated software when only a tiny percentage of your market is using it? This is a business decision for WhatsApp and based on this announcement, it is clear that this “lost audience” is only 0.5% of their market share. For an app that has 1 billion active user base, that is 5 million users “only”. A second look at the “lost” audience: How many users is WhatsApp leaving on the table and what is the opportunity for competitors? Let’s take scientific calculation of actual number of users WhatsApp is probably leaving on the table. From a purely smartphone perspective, this is 5 million. However, if you factor in the feature phones, a new reality emerges. 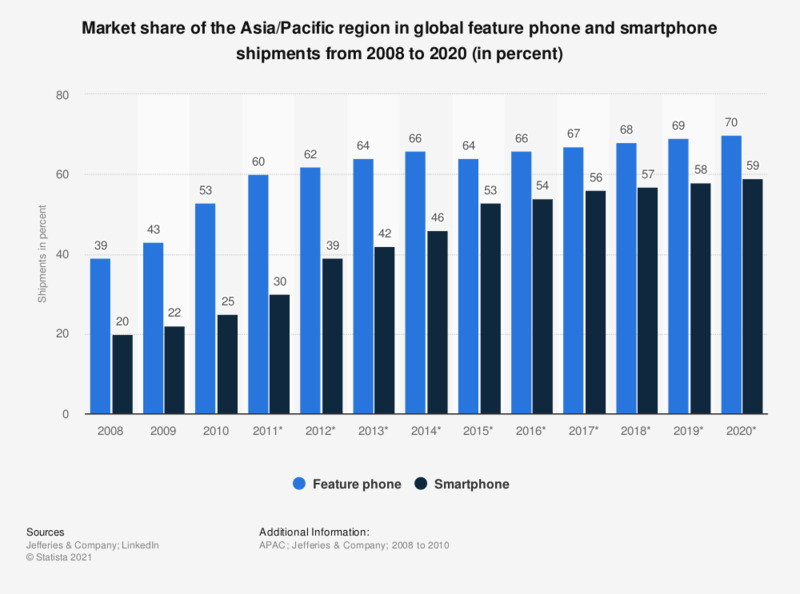 In fact, according to Statista, the number of feature phones that is estimated to be shipped post-2016 in Asia/Pacific region for example, is still higher than smartphones. Another market insight by MobiForge reported that mobile subscriptions market growth is being driven by demand from the developing world, particularly in Africa which has the lowest mobile penetration worldwide at 69.3 percent. So, if you extrapolate that a good number of this subscription could be on feature phones and low-end smartphones, then you can easily understand why a new app should take advantage of this opportunity for good. In fact, 2Go app was made for this audience in mind. To be objective, the economic power of this audience might be too low for WhatsApp to worry about, but it could be big enough for someone else. In developing markets across Asia and Africa, where technology is still limited and high-end smartphones are still a luxury, any messaging app that captures this “lost” audience can still reap a massive ROI from the audience leftover from WhatsApp. Revenue from mobile is still limited but platforms like Eskimi will be happy to ramp up these WhatsApp “crumbs” and monetize them appropriately. Who knows, if this can become a re-emergence for mXit, 2Go or eSkimi who used to dominate the messaging space in Africa before WhatsApp beat them all to it. Before writing this piece, I left a comment on an earlier post that sums up my position. 2 replies to "Why WhatsApp is “bleeding” away 5million users and the untapped opportunity it just created"